It is time for Oconee County to provide some fulltime emergency ambulance service. The county and its revenues have grown tremendously for the last several years. Yet we still rely on volunteer firemen (First Responders) and the generosity of St Mary”s Hospital for ambulance service. As Oconee Commission Chair (1989-2000), I used to hear the Madison (Bill Madden) and Oglethorpe (Billy Bryant) Chairmen bemoan the costs of hired ambulance service in their counties. Rural counties were strained to provide the service, including overtime for employees. In the 90’s, some Oconee EMT personnel approached me and the BOC about paid ambulance service. It is a very expensive operation. Generally, our Volunteers were opposed to paid ambulance service and it was very expensive. St Mary’s stepped forward and agreed to station an ambulance at Watkinsville. We provided space, utilities and other support. That has worked well for 12-15 years. Now, St Mary’s and Athens Regional Medical Center want to get out of the ambulance business because they are losing money. The best option would seem to be for Clarke and Oconee Counties to have subsidized the two hospitals.The loss of $ 1 Million a year is not that much money for the two county governments if shared on a population basis. In my law practice, I know that ambulance bills can run $ 700 to $ 1,000. Often, citizens do not have insurance and the hospitals have to absorb the loss. Citizens need and deserve an efficient and professional ambulance service. That should be a governmental expense. The two counties should have been alert to the hospitals getting out of the ambulance business. If they can’t make it, we can assume that private companies will have to either cut corners or raise the charges on paying customers. In Oconee County we have found money to build a larger jail, a huge recreation complex and other such amenities. We are now talking about a new SPLOST for $ 40 Million – I doubt that will be realized in the current economic climate and the construction recession in Oconee County. Athens Banner-Herald 9-8-08-- Athens Regional Medical Center and St. Mary's Hospital are working together to choose one ambulance company to provide EMS service for Clarke and Oconee counties after hospital officials announced in February they were losing $ 1 million on the services each year. Athens' EMTs and paramedics will have the option to keep their jobs no matter which private ambulance company wins the contract to answer 911 calls in Clarke and Oconee counties, the emergency services' executives say. Athens Regional Medical Center and St. Mary's Hospital are working together to choose one ambulance company to provide EMS service for Clarke and Oconee counties after hospital officials announced in February they were losing $ 1 million on the services each year. Each company operates in a number of counties in Georgia, but not all do so without subsidies. National EMS operates in Rockdale and Morgan counties with the help of a government subsidy and likely would need the same help in Athens, Atkins said. Neither Athens-Clarke or Oconee officials offered a government subsidy, saying hospital administrators wouldn't present specific enough proposals for elected leaders to consider. Government leaders want the authority to decide who can provide ambulance coverage to residents should Athens' two hospitals choose a private company that fails to provide adequate service. Oconee County commissioners last week notified the state's Region 10 EMS Council - a board of area government leaders and health care officials - that they intend to request control of a zone apart from the one already held by St. Mary's Hospital. Should the Oconee County government gain control of an EMS zone, government leaders would be free to pick their own ambulance service or establish a county-based service to cover the area. Oconee County's request for its own zone came two days before St. Mary's Hospital and Athens Regional Medical Center officials were expected to announce which private ambulance company would take over EMS service in Clarke and Oconee counties. The hospitals' leaders, who said they are losing $ 1 million a year on their ambulance services because of declining Medicare and Medicaid payments and escalating health care costs, decided earlier this year to get out of the business. Oconee County leaders are willing to offer a subsidy to the EMS provider chosen by Athens' two hospitals, according to Commissioner Chuck Horton. But without their own zone, county officials would be left with no voice in how to manage that provider should the ambulance company fail to meet the standards under which it was hired, Horton said. "We think it's in our best interests to ask for our own zone," he said. "It gives us the freedom to look after ourselves." Most county governments in Georgia offer a subsidy for EMS service, Terwilliger said, and allowing a zone to cross borders would create a tax nightmare. The state's Region 10 EMS Council will likely base its decision on whether to award Oconee County its own zone on several factors, he said, including if doing so would benefit residents. At least in Oconee County, officials aren't completely against spending some money to prop up ambulance service. Oconee County Commission Chairman Melvin Davis said a subsidy is not out of the question to help St. Mary's Hospital keep its ambulance service. But, Davis said, commissioners have not been given the opportunity to make that decision. Commissioners, he said, asked for cost figures from St. Mary's officials more than a month ago. "We haven't seen any calculations or estimates on what it would cost Oconee County residents to utilize those services," he said. "So, at this point, I can't say what we would do." 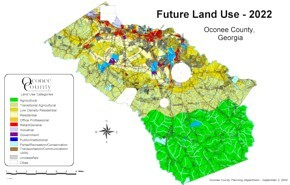 And time may be running out for Oconee County commissioners to make that decision. Oconee County is approaching crunch time for its budget proposals, Davis said, and commissioners would need to decide by June how to fit the extra expense into the budget. Some counties' taxpayers are luckier than those of Madison and Oglethorpe. Oconee County has about the same population as Madison County, but its taxpayers pay less than $ 100,000 for emergency medical services. That's about half a percent of the county's budget, said Oconee County Commission Chairman Melvin Davis. Because the county's most densely populated areas are near Athens, the county is served by the ambulance service of St. Mary's Hospital in Athens, said Quentin Still, director of Oconee County's Emergency Medical Service and Emergency Management Agency. Oconee County helps with a small amount of operating money to pay for costs like utilities, but the main EMS cost for Oconee taxpayers is to run a network of "first responders," people trained in life-saving skills who volunteer to respond quickly to wrecks, calls for medical help and other situations along with the ambulances. The volunteers use county-owned first responder vehicles, equipped with life-saving equipment but not medicines or stretchers, as ambulances are. Many of the volunteers work for ambulance services themselves, Still said. But as first responders, they don't transport patients to hospital emergency rooms, as emergency services do. Still sees a time when Oconee County taxpayers may have to chip in more, though. The first responders are especially helpful in the county's more sparsely populated southern portion, farther away from the St. Mary's ambulance stations in the north. But in recent years, it's been getting tougher to find volunteers, he said. "It's getting to be a problem," he said. Volunteer fire departments, not just locally but nationally, are also having a harder time finding volunteers, but it seems to be worse for volunteer emergency medical volunteers, he said. WATKINSVILLE - In a county where ambulance service does not exist, a group of trained medical volunteers have the responsibility of being the first on a scene of any type of emergency or accident to control the situation until more help arrives. In Oconee County, these volunteers are known as First Responders. These volunteers, who have at least an emergency medical technician (EMT) certificate, drive stocked sport-utility vehicles making sure they're available to assist in any emergency. Since the county does not have an ambulance service, it has to rely on ambulance services from neighboring Athens-Clarke County to take victims of trauma or sudden illness to a hospital. Because an ambulance is sometimes 10 to 20 minutes away, the First Responders play an important role in saving peoples' lives. But these situations do happen and will continue to happen in the future, which is why the county has decided to put more of a funding emphasis on public safety in this year's budget. The Oconee County Commission has already approved the purchase of additional emergency equipment, and the hiring of an assistant to the Emergency 911 center. The commission recently approved a 2005 fiscal-year budget of almost $ 800,000 for public safety like the First Responder program. In 2002, the county allotted approximately $ 300,000 for public safety. The county also hired the engineering firm Precision Planning Inc. to draw up a concept plan for a new Emergency Operations Center/E-911 Center, which will be built with revenue from the most recent special-purpose, local-option sales tax approved by Oconee residents. Athens-Clarke and Oconee County citizens are about to experience a manmade crisis regarding emergency medical services…………. …………….our two local hospitals are about to reduce emergency medical coverage and compromise public safety. No guidelines are in place to insure that the level of care we currently require will be maintained. It's time our elected officials became active participants in this process. They need to demand that advanced life support coverage at its current level be maintained, and that oversight is in place to protect public safety…………………..
Athens and Oconee County residents should have the chance to voice their opinions on what type of ambulance service will answer the call in an emergency, two veteran health care workers say. After all, the choice isn't simple and the consequence of a bad decision could be catastrophic, said David Brooks, a paramedic and 12-year veteran of the EMS industry. "We pay for fire, and we pay for police, but (local government officials) don't think we need to pay for EMS," Brooks said. Athens Regional Medical Center and St. Mary's Hospital confirmed last month that they are deciding whether to give up their ambulance services to a private company after the Athens-Clarke government declined to take over the businesses or to provide the hospitals a subsidy. ARMC and St. Mary's respond to 8,000 to 9,000 calls per year, mostly for heart attacks, strokes or car crashes, and both lose more than $ 1 million each year, officials said, primarily because of the Medicare and Medicaid shortfalls. To compensate for these shortfalls, a private service likely would operate with a smaller ambulance fleet compared to what's currently on the roads in Clarke and Oconee counties, fewer personnel working for less money, longer response times and a loss of state-of-the-art medical equipment, such as cardiac monitors, Brooks said. "The only way (a private company) can come in here and make a profit is to offer lower services and cut vehicles. So, instead of having five ambulances in Athens, they're going to have two. They can't afford to staff what's being staffed now," Brooks said. The majority of the hospitals' medics likely won't apply to work with a private company, said Sam Rafal, an Athens emergency medical technician and CPR instructor with 21 years of experience. "I would be willing to bet if a for-profit service took over this community's coverage that we would probably lose 70 to 90 percent of our best medics," Rafal said. Operating costs for one ambulance that is available 24 hours a day run about $ 500,000, he said. With five ambulances operating in Athens, if Clarke County agreed to take on an ambulance service, taxpayers would shell out $ 3 million a year. Most of the sales tax revenue -- $ 10 million -- will go toward infrastructure work in the county, including water and sewer projects and road and bridge improvements. The next-largest project is expansion of the county jail at a cost of $ 1.5 million. Improvements to recreational facilities in the county are allocated $ 1.3 million, which includes several improvements at Heritage Park and improvements to the soccer field and tennis courts at Herman C. Michael Park. Work on the Bogart Recreational Complex is also slated. A new emergency operations center is earmarked for $ 350,000. It will pull together several emergency services, including 911 communications, the rescue unit and the ambulance service. A new animal shelter will cost $ 350,000 and may be constructed on property the county owns on Branch Road………..